Twentieth-century modernism reduced the list of nineteenth-century American poets to Walt Whitman, Emily Dickinson, and (less often) Edgar Allan Poe. The rest were virtually forgotten. This volume in the MLA series Options for Teaching marks a milestone in the resurgence of the study of the rest. 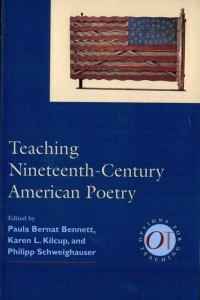 It features poets like Henry Wadsworth Longfellow and Lydia Huntley Sigourney, who were famous in their day, as well as those who were marginalized because of their race (Paul Laurence Dunbar, Alexander Posey) or their sociopolitical agenda (Emma Lazarus, John Greenleaf Whittier). It also takes a fresh look at poets whose work has been dismissed as sentimental (Frances Osgood), genteel (Oliver Wendell Holmes), or didactic (William Cullen Bryant). This volume emblematizes nineteenth-century poetry’s resurgence as an academic field, speaking to the long-neglected group of poets, like Longfellow and Whittier, who were taken as canonical in their own period, and those who were not–principally women and minority poets. In these essays American poetry reemerges as a quintessentially democratic form of social and political address, significant not only for its time but for our own.